Medicine wheels, or sacred hoops, are stone structures built by certain Indigenous peoples of the Americas apparently for astronomical, ritual, healing, and teaching purposes. They were constructed by laying stones in a particular pattern on the ground. Most medicine wheels resemble a wagon wheel, having a center cairn of stones surrounded by an outer ring of stones, and then "spokes," or lines of rocks, coming out from the cairn. The outer rings could be large, reaching diameters of as much as 75 feet. They were often constructed at or near the summit of a hill. Medicine wheels are found in the prairie regions of Canada and the United States, such as Alberta, Manitoba, Saskatchewan, Wyoming, and Montana. They were commonly used by the Ojibwa and Anishinaabe peoples, some structures dating back as much as 4,500 years. Some, such as the Bighorn Medicine Wheel, continue to be used by Native Americans for religious ceremonies. While the original purpose of these stone structures is not known with certainty, they provide an intriguing link to the lives and culture of those who lived long ago. The term "medicine wheel" was first applied to the Big Horn medicine wheel in Wyoming, the most southern archeological wheel still extant. The term "medicine" was not applied because of any healing that was associated with the medicine wheel, but denotes that the sacred site and rock formations were of central importance and attributed with religious, hallowed, and spiritual significance. The hoop is symbolic of "the never-ending circle of life." It has no beginning and no end. Many tribal groups across North America used the hoop in traditional healing ceremonies, and the hoop's significance enhances the embodiment of healing ceremonies. Tribal healers and holy men have long regarded the hoop as sacred and many have used it in their ceremonies. Medicine wheels were constructed by laying stones in a particular pattern on the ground. This pattern often looks like a wagon wheel lying on its side. They are much larger structures than the simple "tipi rings"—circles of cobble stones used to hold down the edges of the tipis belonging to the Plains Indians. John Brumley, an archaeologist from Medicine Hat, has provided a very exacting definition of what constitutes a medicine wheel. He noted that a medicine wheel consists of at least two of the following three components: (1) a central stone cairn, (2) one or more concentric stone circles, (3) two or more stone lines radiating outward from a central point. Even though all medicine wheels have at least two of the three elements (the center cairn, the outer ring, and the spokes), there are many variations on this basic design, and every wheel found has been unique and has had its own style and eccentricities. The most common deviation between different wheels are the spokes. These can vary in number, distance between them, and length. The spokes within each wheel are rarely spaced out evenly, or even all the same length. Some medicine wheels have one particular spoke that is significantly longer than the rest, suggesting that the direction in which it points has significance. Another variation is whether the spokes start from the center cairn and go out only to the outer ring, or whether they go past the outer ring; they may even start at the outer ring and go out from there. An odd variation sometimes found in medicine wheels is the presence of a passageway, or a doorway, in the circles. In such cases, the outer ring of stones will be broken, and there will be a stone path leading up to the center of the wheel. Also many medicine wheels have various other circles around the outside of the wheel, sometimes attached to spokes or the outer ring, and sometimes located free of the main structure. Brumley suggested classifying them into several subgroups, based on their general characteristics: Type 1, the most common, consists of a central cairn surrounded by a stone circle; Type 2 contains a passageway leading out from the central cairn through the circle; Type 3 consists of a central cairn with radiating cobble lines or "spokes"; Type 4 consist of a stone circle from which spokes radiate outward; Type 5 structures contain a circle with spokes radiating inward; Type 6 is similar to Type 5 but with a central cairn; Type 7 have a central cairn surrounded by a stone circle with spokes radiating outward; Type 8 structures are similar, but the spokes radiate from the central cairn and cross the circle. Although archaeologists have not ascertained the purpose of each medicine wheel with certainty, it is thought that these structures had ceremonial and/or astronomical significance. Medicine wheels and sacred hoops have been built and engaged ritually for millennia, and each one has enough unique characteristics and qualities that archaeologists have encountered significant challenges in determining with precision what each one was for; similarly, gauging their commonality of function and meaning has also been problematic. One of the older wheels has been dated to over 4,500 years old. Like Stonehenge, it had been built up by successive generations who would add new features to the circle. Due to the long existence of such a basic structure, archaeologists suspect that the function and meaning of the medicine wheel changed over time, and it is doubtful that we will ever know what its original purpose was. Scattered across the plains of Alberta are tens of thousands of stone structures. Most of these are simple circles of cobble stones which once held down the edges of the famous tipi of the Plains Indians; these are known as "tipi rings." Others, however, were of a more esoteric nature. Extremely large stone circles—some greater than 12 metres across—may be the remains of special ceremonial dance structures. A few cobble arrangements form the outlines of human figures, most of them obviously male. Perhaps the most intriguing cobble constructions, however, are the ones known as medicine wheels. Often located at the summit of a hill, medicine wheels were well positioned for both astronomical and spiritual meaning. Medicine wheels have been used to mark the geographical directions and astronomical events of the sun, moon, some stars, and some planets in relation to the Earth's horizon at that location. These rock sites were also used for important ceremonies, teachings, and as sacred places (like the High places of other cultures) to give thanks to the Creator, Great Spirit, or Gitchi Manitou in the Ojibwa or Anishinaabe language. Other North American indigenous peoples also made these circular petroforms. Medicine wheels can be seen as similar to circular turtle shaped petroforms, where the legs, head, and tail point out the directions and are aligned with astronomical events. Astronomer John A. Eddy put forth the theory that some of the wheels had astronomical significance, where spokes on a wheel could be pointing to certain stars, as well as sunrise or sunset, at a certain time of the year, suggesting that the wheels were a way to mark certain days of the year. Other scientists have shown that some of the wheels mark the solstice. Medicine wheels are sited throughout northern United States and southern Canada, specifically South Dakota, Wyoming, Montana, Alberta, and Saskatchewan. The majority of the approximately 70 documented architectural hoops still extant are located within Alberta. One of the prototypical medicine wheels remains within the Bighorn National Forest in Big Horn County, Wyoming. This 75 feet (23 m) diameter wheel has 28 spokes, and is part of a vast set of old Native American sites that document 7,000 years of their history in that area. 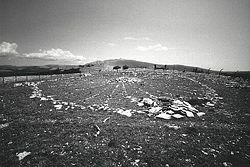 The Medicine Wheel/Medicine Mountain National Historic Landmark (formerly known as the Bighorn Medicine Wheel) is a medicine wheel located in the Big Horn Mountains of the U.S. state of Wyoming. The site was declared a National Historic Landmark in 1970, and renamed as the Medicine Wheel/Medicine Mountain National Historic Landmark in 2011. For centuries, the Bighorn Medicine Wheel has been used by Crow youth for fasting and vision quests. Native Americans also go to Bighorn to offer thanks for the creation that sustains them, placing a buffalo skull on the center cairn as a prayer offering. Prayers are offering there for healing, and atonement is made for harm done to others and to Mother Earth. The structure is located at an altitude of nearly 10,000 feet (3,000 m), near the summit of Medicine Mountain. It is a precolumbian structure, built from roughly loaf-sized stones gathered from the surrounding area. 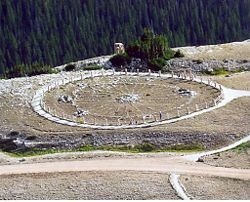 The structure consists of a circular rim, 25 yards (23 m) in diameter, 28 spokes extending from the rim to the center, and a series of seven cairns. Cairn O is at the center of the structure and is almost 10 feet (3.0 m) in diameter. Cairns A - F are at or near the rim, and are considerably smaller. Astronomer John A. Eddy investigated this structure in 1972 and made a number of important discoveries. He found that cairns E and O were aligned in the direction of summer solstice sunrise and that cairns C and O were aligned in the direction of summer solstice sunset. Further he found that cairn pairs FO, FA, and FB correspond to the rising points of the stars Sirius, Aldebaran, and Rigel, respectively. Observing the first yearly heliacal rising of these stars would have been an effective tool at predicting how many days remained before the summer solstice, as the first heliacal rise of a star occurs on the same date. The FA Aldebaran alignment would have worked best between 1200 C.E. and 1700 C.E. The Majorville Medicine Wheel is located in Alberta, just outside the small town of Milo which is 75 miles southeast of Calgary. It is a designated Canadian Provincial Historic Resource. This wheel is similar to that at Bighorn, although somewhat less developed. It is the largest such structure in Canada, and the oldest continuously used sacred site in North America. The wheel has an enormous central cairn, 29 feet (8.8 m) in diameter and 5.3 feet (1.6 m) high, surrounded by a stone circle 88 feet (27 m) in diameter with 28 spokes linking the central cairn and the circle. It has been suggested that the 28 spokes correspond to the 28 days of the lunar month. Like the Bighorn Medicine Wheel and the Moose Mountain Medicine Wheel in Saskatchewan dated to 1,700 years ago, the Majorville Medicine Wheel is aligned to the summer solstice and the four stars, Aldebaran, Fomalhaut, Rigel, and Sirius. Excavations of the central cairn have dated the beginning of this construction to 4,500 years ago. The Sundial Hill Medicine Wheel is located east of Carmangay, Alberta. The location of the wheel is on the summit of Sundial Hill, which commands an extensive view across the plains in all directions. Although it has not been excavated, it has been studied and was the subject of George Dawson's 1855 report, the first published on a medicine wheel in Canada. This stone structure has a large central cairn surrounded by two rings of stones. There is also a pathway, made of stones, that faces south from the central cairn leading through the rings to the outside. This style of wheel is classified by John Brumley as Subgroup 2, of which there are six known examples—four in Alberta, one in Saskatchewan, and one in Montana. Inspired by the Bighorn Medicine Wheel, in 1992 Professor Joe Stickler and his students at Valley City State University began work on Medicine Wheel Park. The large circle of the medicine wheel measures 213 feet (65 m) feet around. There are 28 spokes radiating from the center that represent the number of days in the lunar cycle. In addition, six spokes extending beyond the wheel are aligned to the positions of sunrises and sunsets on the first days of the four seasons. As well as the "horizon calendar" formed by the wheel, there is also a "meridian calendar" formed by three large rocks located north of the pole which mark the top of the pole's shadow at the beginning of each season. ↑ 1.0 1.1 1.2 Royal Alberta Museum, What is a Medicine Wheel? Retrieved November 12, 2011. ↑ Phylameana lila Desy, Medicine Wheel - Sacred Hoop About.com. Retrieved November 17, 2011. ↑ Dennis Zotigh, History of the modern Hoop Dance Indian Country Today, May 30, 2007. Retrieved November 12, 2011. ↑ John H. Brumley, Medicine Wheels on the Northern Plains: A Summary and Appraisal (Alberta Culture and Multiculturlism, Historical Resources Division, 1988, ASIN B0006ER0ZS). ↑ Alice B. Kehoe and Thomas F. Kehoe, Solstice-Aligned Boulder Configurations in Saskatchewan (Ottawa: National Museum of Canada, 1979), 7. ↑ National Park Service, Medicine Wheel National Historic Landmark summary listing. Retrieved November 16, 2011. ↑ Medicine Wheel landmark gets new boundary Lovell Chronicle (July 7, 2011). Retrieved November 16, 2011. ↑ Sacred Destinations, Bighorn Medicine Wheel. Retrieved November 16, 2011. ↑ John A. Eddy, "Astronomical Alignment of the Big Horn Medicine Wheel" Science 184(4141) (1974):1035-1043. ↑ 10.0 10.1 Brad Olsen, Sacred Places North America: 108 Destinations (San Francisco, CA: CCC Publishing, 2008, ISBN 978-1888729139). ↑ Liz Bryan, Stone by Stone: Exploring Ancient Sites on the Canadian Plains (Surrey, BC, Canada: Heritage House, 2005, ISBN 978-1894384902), 95. ↑ Valley City State University, Medicine Wheel Park Retrieved November 16, 2011. Bolton, Kerry R. The Wheel as a Symbol of Fate The Esoteric Quarterly (Winter 2011): 73-81. Retrieved October 3, 2011. Eddy, John A. "Astronomical Alignment of the Big Horn Medicine Wheel" Science 184(4141) (1974):1035-1043. Yanko, Dave. Endangered Stones Virtual Saskatchewan. Retrieved September 27, 2011. Zotigh, Dennis. History of the modern Hoop Dance Indian Country Today, May 30, 2007. Retrieved October 3, 2011. This page was last modified on 13 September 2018, at 22:22.